Rest easy while these three stocks pad your retirement portfolio. For retirees, buying and holding high-quality dividend stocks is arguably the best way to predictably create and sustain wealth. But investing for retirement can admittedly feel like an overwhelming task with your financial future on the line. To that end, we asked three top Motley Fool contributors to each discuss a dividend stock that they believe is perfect for retirees. Read on to learn why they chose Starbucks (NASDAQ:SBUX), Verizon (NYSE:VZ), and General Mills (NYSE:GIS). Steve Symington (Starbucks): Starbucks stock has fallen around 3% so far in 2018, despite the company's posting record revenue and earnings in its most recent quarter. Of course, investors are mostly concerned with the coffee behemoth's struggles when it comes to growing comparable sales -- that is, sales from locations that have been open longer than a year. In particular, the market is worried about the 2% comps decline Starbucks posted in China last quarter. Still, I'm not convinced that's indicative of the brand or its potential. During last quarter's conference call, CFO Scott Maw noted that Starbucks has continued "to grow share in virtually every market and channel in which we operate." But I also think investors are overlooking Starbucks' massive global growth potential. The company plans to nearly double its number of China locations to 6,000 by the end of 2022, and -- keeping in mind it already has 14,000 locations in the U.S., where the population is roughly a quarter of that in the Middle Kingdom -- should be able to continue that torrid pace of expansion for the foreseeable future after it reaches that goal. With shares trading at a reasonable 17.8 times trailing 12-month earnings -- well below the S&P 500's average price-to-earnings ratio of 22.9 -- and a healthy dividend yielding 2.6% annually, I think Starbucks offers a perfect blend of income and potential share-price appreciation for retirees willing to look at it through a long-term lens. 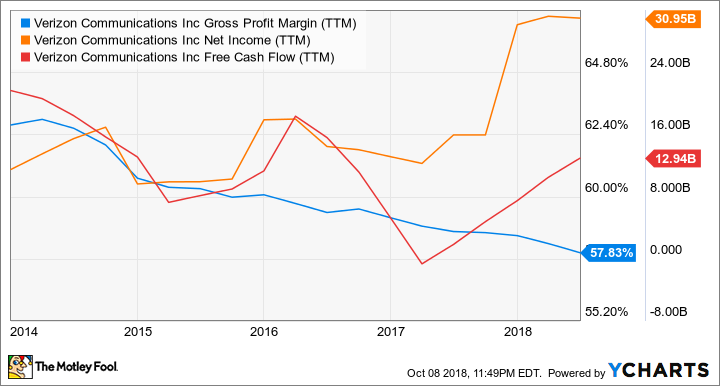 Travis Hoium (Verizon): Retirees looking for dividend stocks should be looking for companies that have consistent cash flow and operations that are difficult to disrupt. Wireless services fit that bill, especially from an industry leader like Verizon. VZ Gross Profit Margin (TTM) data by YCharts. While the existing business is solidly profitable, it is facing pricing pressure from smaller rivals, which have slowly closed the gap with Verizon's network capability. That's what's caused the falling margin you see above. But this is where the company's long-term advantage kicks in. Verizon is now building out a 5G network that will allow for download speeds that match, or beat, broadband, and will enable new technologies like self-driving cars and smart cities. Verizon may even be able to offer home wireless service, replacing cable and DSL broadband. As 5G is rolled out, beginning this year, Verizon will once again have pricing power, and a network smaller rivals can't compete with because they're at least a year or two behind in 5G. Not only is Verizon well-positioned for growth, but it's also a good value for investors. Shares trade at just 11.4 times forward earnings estimates and trade at a 4.4% dividend yield today. Unless people stop using wireless technology, which I don't think is likely, Verizon is going to be a winner for a long time and keep paying dividends that can fund your retirement. Leo Sun (General Mills): General Mills owns a sprawling portfolio of well-known packaged-food brands, including Cheerios, Yoplait, Betty Crocker, and Haagen-Dazs. The company currently pays a forward dividend yield of 4.5%, and it's raised that payout annually for 14 straight years. General Mills spent just 54% of its earnings and 51% of its free cash flow on those dividends over the past 12 months, so it has plenty of room for future hikes. General Mills struggled in recent years as consumers shifted toward healthier foods. Breakfast cereals, once a pillar of General Mills' growth, were hit particularly hard by that shift. To offset the ongoing slowdown in its legacy brands, General Mills acquired companies with healthier reputations, like organic food maker Annie's, and expanded into pet food with its takeover of Blue Buffalo Pet Products. General Mills' growth may seem glacial. It expects flat to 1% organic sales growth this year, and its adjusted EPS to fall between flat and a 3% decline on a constant currency basis. However, most of that earnings decline can be attributed to its $8 billion takeover of Blue Buffalo, which closed earlier this year. But looking further ahead, analysts expect General Mills to grow its earnings at a average rate of 6% over the next five years. That's a decent growth rate for a stock which trades at just 13 times forward earnings. That low valuation, combined with General Mills' well-diversified business and high yield, make it an ideal income stock for retirees. Of course, we can't absolutely guarantee that these three stocks will go on to continue creating shareholder value and beat the broader market. But between Starbucks' attractive valuation and global growth potential, Verizon's solidly profitable business and impending 5G rollout, General Mills' enviable portfolio of brands, and general capital returns from each business, we think chances are high that they'll do exactly that. And we believe retirees would be wise to put their money to work accordingly.